24 page inventory in full color in attractive cardstock cover. $10.95 in quantities of 25 to 250. CANADIAN PURCHASERS: Final cost will be somewhat higher than that shown due to HST and shipping costs. Please choose the Payment option for payment by COD so you can get the order in our system. We will review your order and send you a final, correct bill for your approval and payment by credit card or bank transfer. 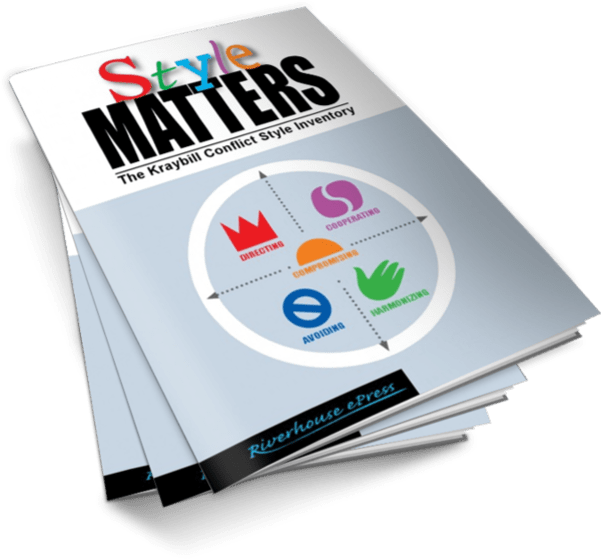 Style Matters is a five-styles-of-conflict inventory designed to help users deal more effectively with conflict. Users take a fifteen-minute quiz and based on this get scores on five different responses to conflict. Style Matters then guides users in using these scores to identify the strengths and dangers associated with their preferred styles. Style Matters is based on the same Mouton-Blake framework as the well-known Thomas Kilmann Conflict Mode Inventory, so it is easy for trainers who've worked with the Thomas Kilmann to make the switch. Cultural adaptability. Users get differing instructions suited to their cultural background, either individualist or collectivist. This feature can be ignored in settings where this is not enough time to use it. Differentiation between Calm and Storm settings recognizes that many people's response to conflict changes when emotions rise. Practical Tips to help each style function at its best - a full page for each style! Available in print version, PDF file with rights to reproduce, or full-scale online version.